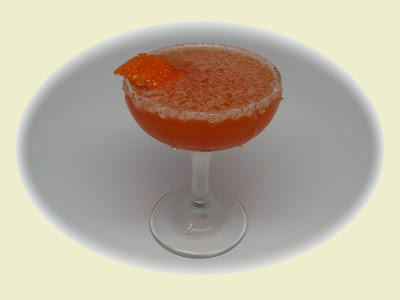 This is again not a huge departure from the original, but it does add a bit of bite and some herbal notes to the classic and simple recipe, as well as imbuing the drink with a pleasant hue. Get the anagram? Part Sidercar and part Sazerac. In fact the Sazerac used to be made with Cognac before the American spirit Rye eventually supplanted the Cognac as the base of the drink. I can't decide the pronunciation, "Side-rack" or "Sid-er-ack," so I'll let the drinker decide according to his mood. The name of course is because smartcars are somewhat eco-friendly, aka green. I told you I liked the first name more. But in any case, I liked this drink more. But I am a sucker for my Chartreuse, as you can see from how often I make use of it in my creations. 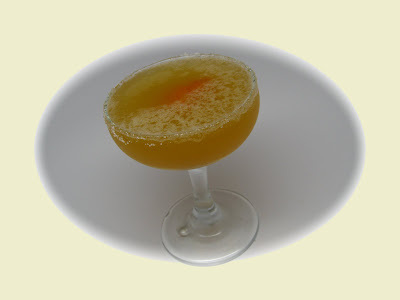 After making this I remembered that Audrey Saunders of the Pegu Club also used Chartreuse to tweak the Sidecar in her Tantris Sidecar, so I can't claim any credit for doing it first, but she had included several other tweaks. In any case, if memory of my last taste of the Tantris at Pegu serves, I somewhat prefer my Smartcar. Ok, perhaps only because it uses twice as much Chartreuse, but what is one to do?